Tipperary boss Michael Ryan during yesterday's game in Nowlan Park. MICHAEL RYAN WAS on the cusp of victory yesterday when Kilkenny snatched the spoils in the finale. He’s not the first Tipperary manager to have suffered in Nowlan Park yet there were visions of a Premier victory entering the closing stages. 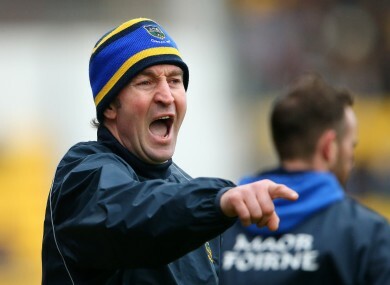 In the aftermath of defeat, the new Tipperary boss was keen to point to the scale of the challenge they face. “Let’s be very clear here, we’re not the only team that’s ever come down to Kilkenny and lost. “Where we stand in the rankings is irrelevant. Whether we’re the second best or the third best team or the fourth best team, they’re the best team. “They’ve proved that over the last decade. Nobody wants to come second, us included. Is it an issue? “We don’t like it but it is what it is. We’re doing our damn-dest to change that around and develop our squad into the squad that we want. After they dismantled Dublin last Saturday in Ryan’s opening league encounter, this was a more strenuous test for Tipperary. But such a battle is more instructive according to Ryan. “I always feel the tighter the game, the more you learn. It’s human nature, but we’ve got our critics when we lose a game as well. “We don’t tend to gloss over some of the positives, we tend to hone in on the negatives. Kilkenny’s late goals came after Tipperary had struggled in that sector to capitalise on similar chances. “Those opportunities to win a big match, you’ve got to take them,” admitted Ryan. “We made a couple of mistakes and they were capital mistakes, goals ensued. Email “'Look it's still February, I wouldn't be panicking' - Ryan calm after Tipp loss”. Feedback on “'Look it's still February, I wouldn't be panicking' - Ryan calm after Tipp loss”.